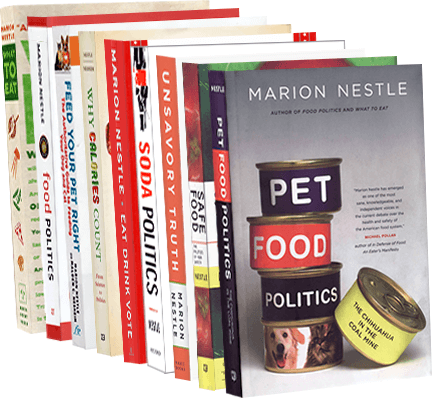 Food Politics by Marion Nestle » Coca-Cola’s new health drink? Coca-Cola’s Christmas gift was a full-page, full-color ad in the December 25 New York Times announcing Minute Maid’s new “enhanced juice.” The label says “Omega-3/DHA HELP NOURISH YOUR BRAIN.” “POMEGRANATE, BLUEBERRY: FLAVORED BLEND OF 5 JUICES.” Curious to see what was in it, I checked the online label information. Surprise! The first two ingredients are Apple and Grape juices from concentrate. Pomegranate comes in at #3. #4 is mixed fruit and vegetable juices, #5 is blueberry juice, #6 is raspberry juice–all from concentrate. Then come #7 gum acacia and #8 DHA algal oil. Others ingredients follow, but never mind. Of course this drink will nourish your brain. It contains an ounce of sugars per 8-ounce serving (and the bottle contains 7 servings)!